Welcome to February in Wisconsin! Snowfall clings to some of the evergreens along Highway 64 between Mountain and Pound. 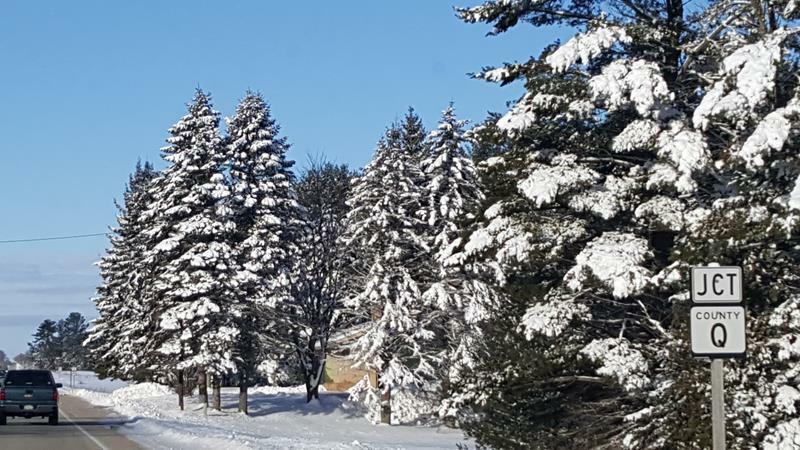 A sunny winter day makes for a beautiful drive in the North Woods. We’re into February and a fresh snowfall has blanketed much of the state! Winter is when Wisconsin shines with everything from skiing to snowmobiling to ice fishing to retreating into your favorite watering hole, fish fry, or resort. Plenty of great winter festivals and events are going on including the Labatt Blue/USA Hockey Pond Hockey National Championships in Eagle River and Winterfest and the U.S. National Snow Sculpting Championships in Lake Geneva. Heck, touring the state’s highways is fun any time of the year. Join us as we check out a bunch of State Trunk Highways and explore everything awesome about Wisconsin!